The search is over: This week, I said “Yes!” to the dress! No, this is not becoming a wedding blog, or anything remotely close to it, but I feel that I at least should keep you posted on the things that distract me from posting on Natural Comfort Kitchen with much regularity these days. Into that category also fall a couple of non-internet, real life cooking and business ventures that I’m desperately trying to keep from becoming last minute scrambles. If you’re local to NYC or Fairfield County, Connecticut, listen up for a minute! On June 14th, 2015, I’ll be hanging at Dew Yoga all day (10 to 3) for an open house fundraiser. There will be yoga all day, by donation, plus activities and vendors like knitting, juicing, and reflexology. And me! I’ll have samples of my Thai sweet potato salad, southwest quinoa salad, and spicy chocolate truffles. These are some of my favorite summer recipes since they’re quick, portable for picnics, and healthy for swimsuit season! Okay, maybe the last one isn’t so healthy, but it could be worse. You can also come to learn more about my personal chef services in case you’re local, want to eat healthy, homemade meals in the summer, but have absolutely zero time with crazy travel plans or running the kids to activities all day. I wish you all lived close and could come join me! Second thing I’m working on for my locals: I’m hosting a summer cooking community through my church, where a handful of ladies and I will come together every week (or every other?) to learn some ideas for healthy, tasty, budget-conscious summer meals. I’m hosting and planning the schedule of meals, but we’ll all contribute seasonal ingredients and prepare a meal together over an app and perhaps a wine pairing or cocktail. Then we’ll sit down to feast on the dinner we made! I’m hoping everyone comes away armed with ideas to spice up the summer dinner routine and a few new cooking technique tips. If you’re close and interested, come on out to Connect Community in Stamford, also on June 14th, at 10:30, to learn more and sign up! Since I can’t be in two places at once, my significant other will likely be representing with all the info and his testimonials about what we eat at home. If you don’t live close, sorry to bore you (or make you jealous?). 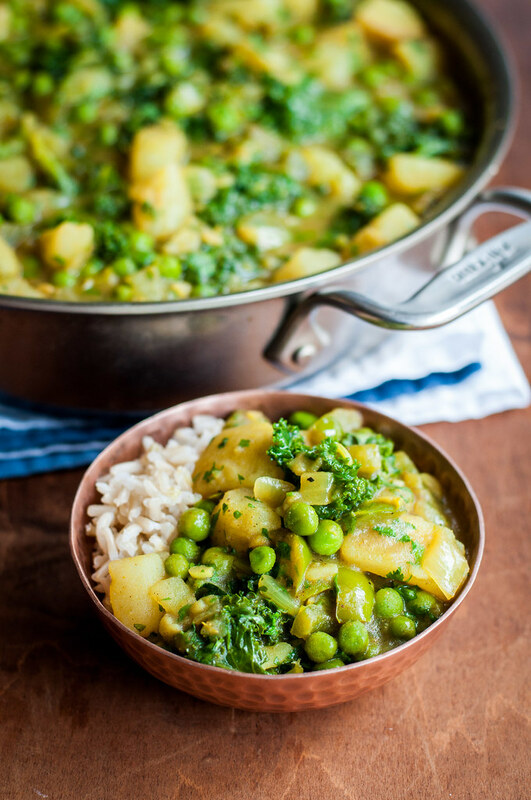 To make up for it, I have this scrumptious weeknight yellow kale curry recipe for you! I threw it together one night as a result of a time crunch, some random leftover produce and baked potatoes in the fridge, and a craving for Indian food. 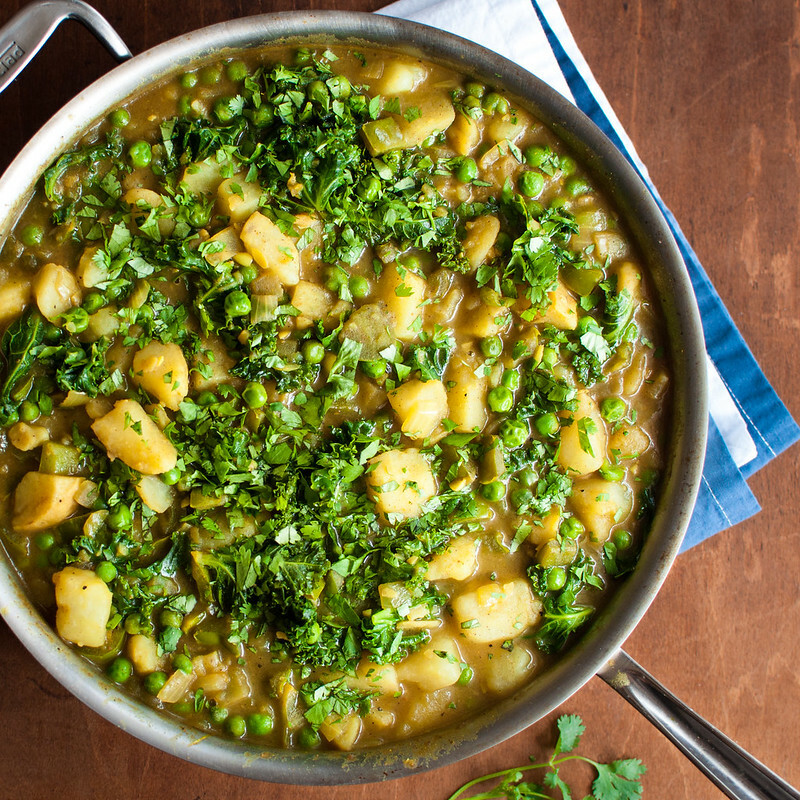 If you’ve never made curry at home, this is a good one to try. 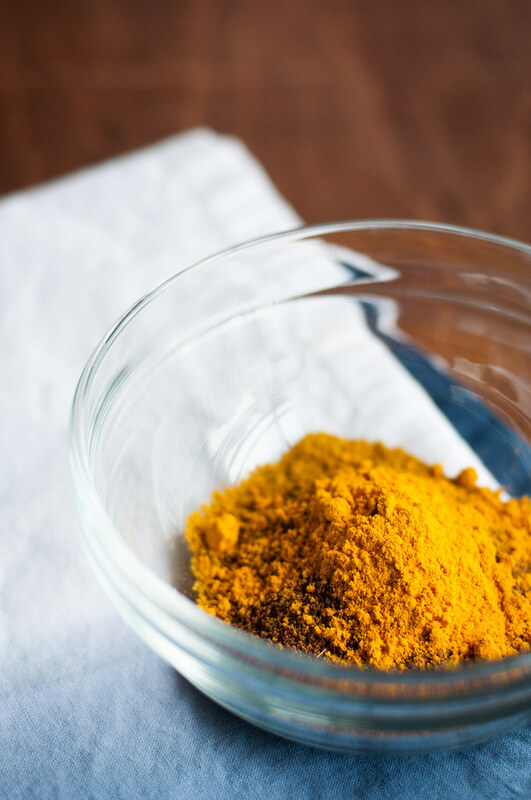 Instead of making a mess grinding and mixing your own expensive blend of ten different spices, curry powder and garam masala contain several spices each to really help you get your money’s worth out of this dinner. While curry is healthy all on its own, I like to pack extra greens into errrrr-y-thing I make, because I just feel amazing the more of them I eat. I have a very love/hate relationship with green smoothies, going through phases where they just do not sound like an appetizing breakfast. During those spells, my best bet is to find ways to pack savory main dishes with greens. So voila! Here we are with a kale curry that I promise you, even the most adamant kale skeptics will, at the very least, eat without complaint (exhibit 1: my fiancé). Hey, you never know, they may just embrace it. 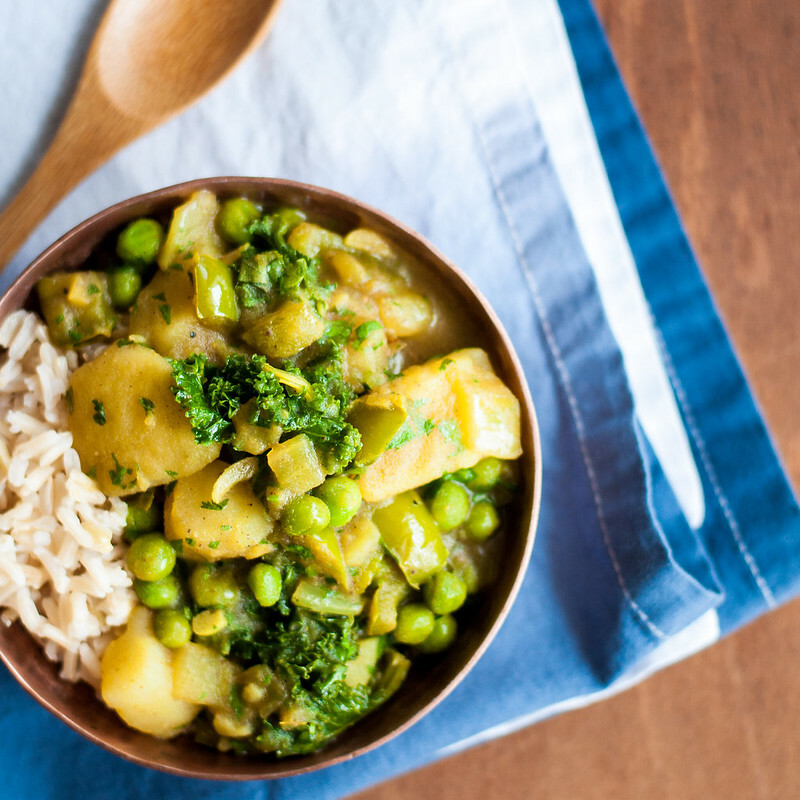 A quick, flavorful weeknight curry with an easy spice list. Cook rice (or quinoa) while you prepare the curry. Halve the recipe to serve two. Leftovers keep extremely well in the refrigerator or freezer. 4 leftover or freshly baked russet potatoes, peeled and chopped about ½ to 1"
Heat oil over medium in a large skillet until very hot. Add onion and bell pepper and cook until very soft but not browned, 5 to 7 minutes. Add garlic and ginger; cook up to a minute, until fragrant but not burned. Add spices and cook 1 minute, until beginning to stick to pan. 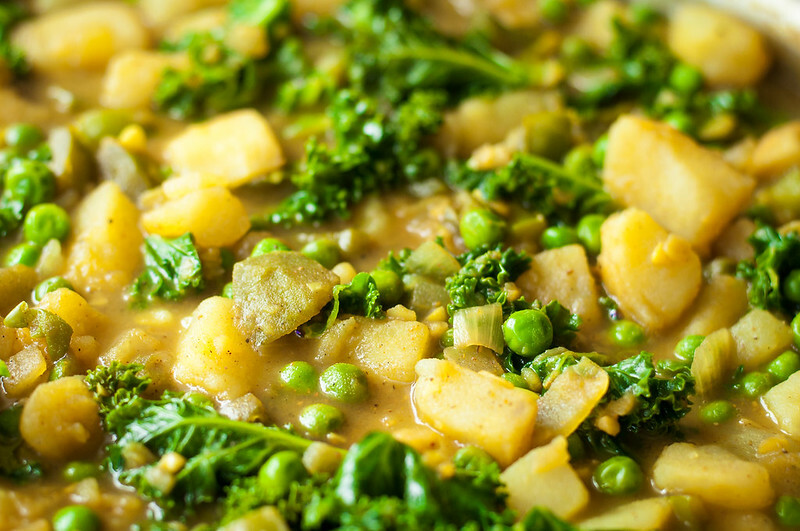 Add stock and potatoes and bring to a vigorous simmer, then reduce heat and simmer gently until potatoes are very tender and moist all the way through and liquid is reduced, about 10 minutes. If you like a thinner, more soup-like sauce, add more liquid a little at a time and simmer until warm and slightly reduced. Add peas and kale and cook until until warm and kale is completely wilted. If kale doesn't all fit in the pan, add a little at a time. Reduce heat to low, add milk/cream and simmer to reduce slightly further, if desired. Off heat add vinegar to taste and cilantro and season with salt and pepper. Serve over rice with desired garnishes. Vegan (if prepared with coconut milk) and gluten free. If you don't have baked potatoes on hand, you could use peeled, uncooked russets. The potatoes will require more time and liquid to cook through. Test for doneness by sampling or seeing if potato chunks are easily pierced with a paring knife. To bake potatoes, place scrubbed russets, pierced in a handful of places with a fork, directly on middle rack in a 400 degree oven. Bake 40 to 60 minutes, until easily pierced with a paring knife or all the way through with a skewer.